If you didn't get a chance to listen to Fade to Black on the 28th of March, not to worry. 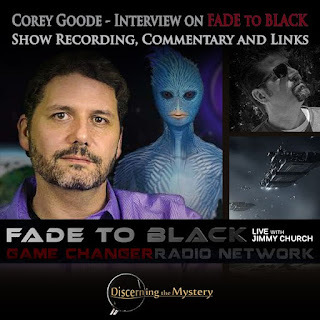 Below is the show recording including the interview with Corey Goode. This show was jam-packed with various subject matters, including the history of the Secret Space Program, Corey's former role within the various programs therein, the role of the group we have been hearing about, Blue Avians. These along with discussions of the present-day need for Full Disclosure made for an intriguing talk on this show. 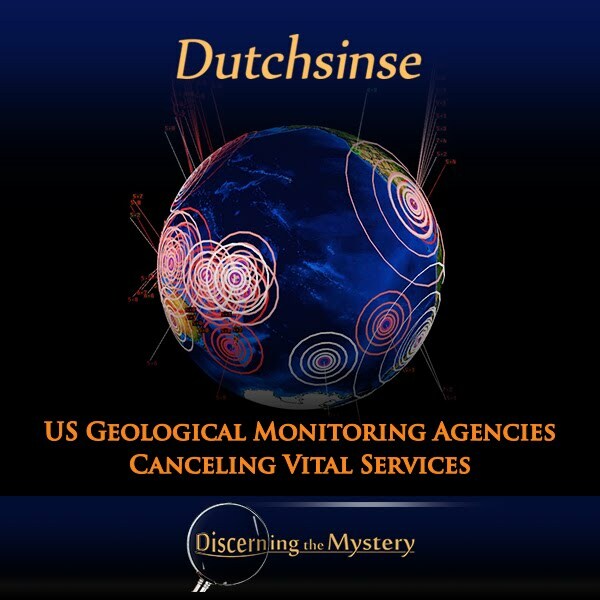 Dutchsinse is a Youtube personality who monitors data from various official monitoring agencies on the subject of weather and geotectonics, analyses it, and then presents his unique style of forecast on how current conditions may impact different areas around the globe. Dutch's accuracy in prediction rivals many of the professional organizations whose data he collects. 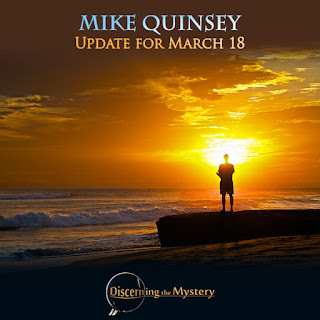 Consequently, he has endured numerous instances of harassment and smear campaigns (most likely due to jealousy) from those within these agencies, but even still, he faithfully gives his take on forecasting on weather and geotectonics. The world is moving into the process of renewal and regeneration. This can be readily seen in world events. All the outworn systems that do not serve the highest good of all are being highlighted through events that are taking place. It is difficult for humanity to comprehend that a higher law is in force when all that they see is chaos and a world gone mad. This is the time for which all Lightworkers of the world have been incarnated upon this planet. Your Light is making a difference! Do not become discouraged by what you view through the lens of the media, there is more at work in the higher perspective than is presented to you. The updates from Mike Quinsey can be helpful to many people in numerous ways. However, there may be some who feel there is not much they can glean from these channelings. These people may be feeling there is more that they need, or they may even feel that they are ready for a challenge. 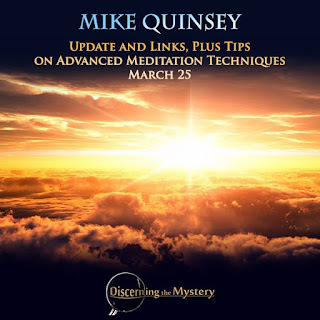 With this in mind, I am going to start including techniques which anyone can apply that will allow them to start connecting with their own higher self, and receive information which is most personal to themselves as individuals. 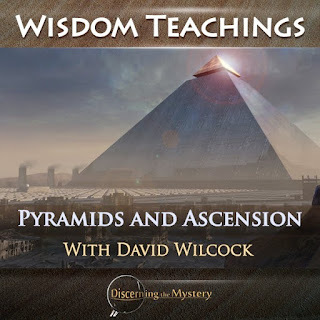 This episode of Wisdom Teachings focused on the technology of pyramids, where they came from, and how they were originally used to increase one's ability to ascend to higher levels of consciousness. The focus of this episode was more on the process of ascension and what is required of an individual in order to achieve it, according to the Law of One. In this article, however, I have included more detail on the technology of pyramids, their origins and a number of examples of the variety of pyramids we see all over the planet. Clearing of the Chimera group continues. The vast majority of plasma strangelet bombs have been removed and now the Light forces are focusing on removal of plasma toplet bombs, successfully using the same approach. Both last week and this week, Cosmic Disclosure has showcased the topics of the highly advanced technologies used by the Secret Space Program, as well as other organizations. I found this week's topic just as interesting as that of the last, which covered nanotechnology and time travel. According to Corey Goode, the former inhabitants of the destroyed planet, Maldek, created an inhabitable living space inside of our own moon using this nanotechnology, which collectively functioned under the guidance of their own artificial intelligence. To read last week's article on this topic, click here. 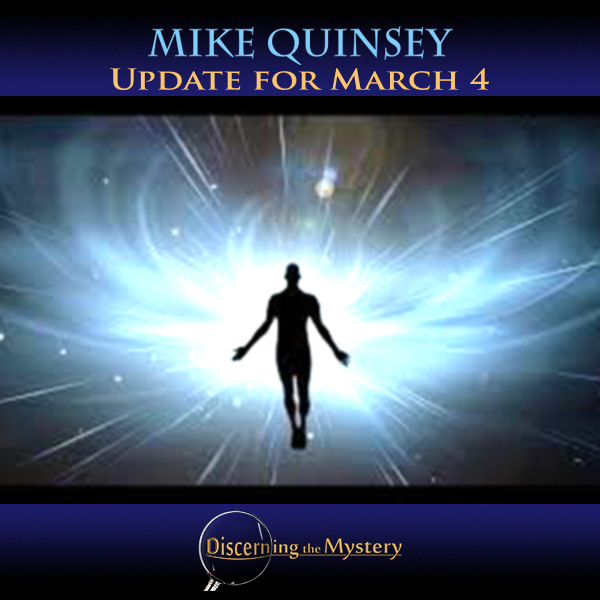 Each week, Mike Quinsey gives his time and energy to bring new insight from his higher self. This is much appreciated, as it seems to benefit many people in their search for knowledge. As many enjoy the updates from Quinsey, I would like to remind us all that each one of us has a higher self. Every one of us, if we make the the effort, can establish solid and reliable contact with our higher aspects so as to gain the insight we need to progress as awakened souls. As we do this, I think it's important for each of us to remember that our contact is only as reliable as we ourselves are in positive integrity, focus, and intent. As we progress in these area, so will our contact with our higher selves, as well as countless other positive sources. We from the ascended realms of Light have been asked for a message specifically to the people of Turkey who have been experiencing frightening horrors through the events occurring in their country for the past eight months. Many souls in Turkey have been holding the Light of the higher vision of peace for their country and for the world and have been and continue to, earnestly pray for this to come into their daily living experience. They are finding it difficult to remain detached from the fear and anger that permeates the hearts of the people and the environment that they have no choice but to be a part of in their country. In recent years, it has become more and more clear that some within the USGS (United States Geological Survey) and the PSNS (Pacific Northwest Seismic Network) are not concentrating on science alone. It seems that, at times, the collective ego of many within these establishments often hold "higher" priorities than scientific accuracy. 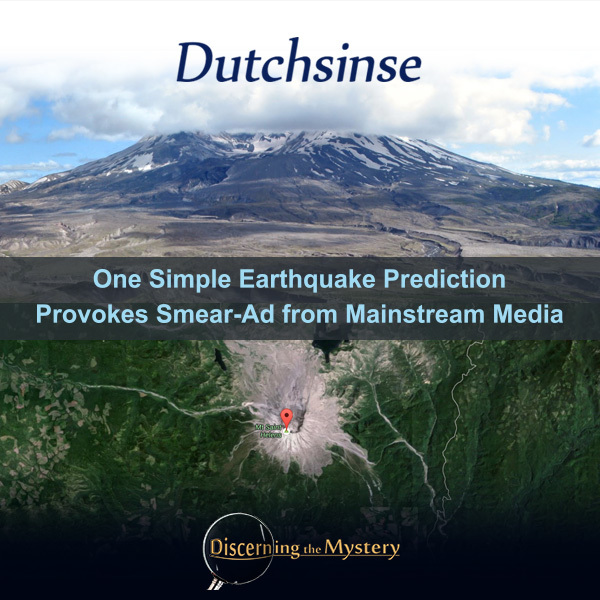 Just days after the Youtube personality, Dutchsinse published a video in which he made a simple earthquake prediction which bordered Mt. St. Helens, a mainstream media news outlet (in connection with these establishments) published blatantly, propagandistic smear content directed specifically at this Youtube personality. The strange part was that this attack made absolutely no reference to the actual prediction of this earthquake. In fact, the prediction was spot-on accurate. 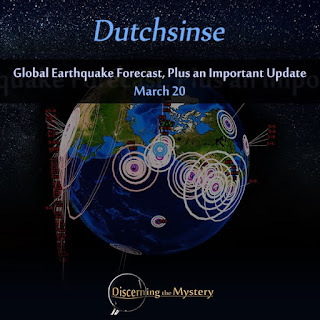 The earthquake did take place and it was right around the region where Dutch predicted it would occur. However, the truth did not seem to matter to this news company. Instead of concentrating on accurate information, this company claimed that Dutch made a statement which he did not make, and afterward, ridiculed him for making this fictitious statement. This tactic is known as an "Ad Hominem Attack". Many of us have heard, in recent times, of the notion that the moon is an artificial satellite, and that it may have come from somewhere else in our galaxy. 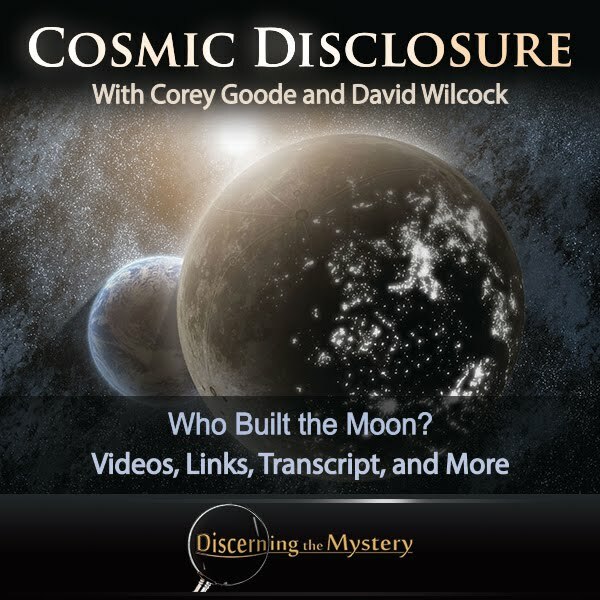 This episode of Cosmic Disclosure is geared toward filling in the gaps with the details of the origin of the moon, according to the experiences of Corey Goode. 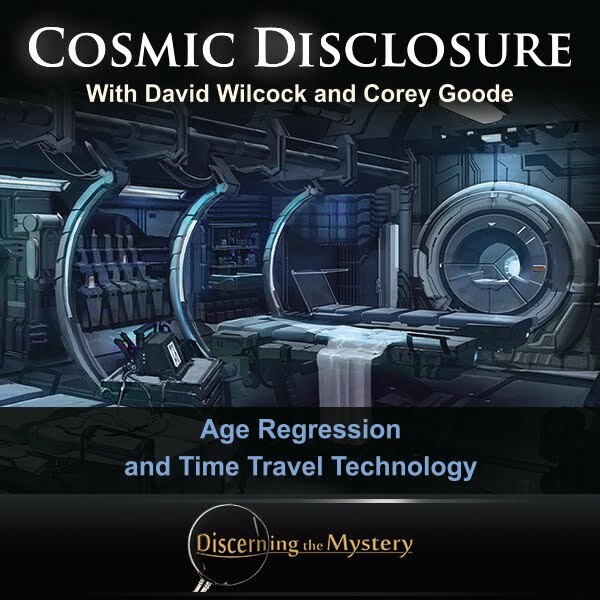 One of the most appealing aspects of the Cosmic Disclosure series, in my opinion, is that it falls in line with proven scientific possibility. We know of the strong possibility that life developed in more places in the universe than just in one bog, near one ocean, on one planet, within one tiny star system in the virtual infinity of the cosmos. If we can accept the possibility that life sprang up from inanimate matter once, it's not much of a stretch to imagine such an occurrence happening twice. If this happened twice, than why would it not be happening everywhere the conditions are right? This does not at all seem far fetched, in my opinion. If we can come this far in our perspective of what we consider to be possible, why couldn't numerous forms of advanced life evolved, develop space-travel capability (as we did), and at some point in time, eventually meet? Who has the ability to say, with certainty, that this has not already happened? The events that will change the course of Human evolution are proceeding well, and are your assurance that Disclosure will take place. Many, many souls are working for the Light, and have the strength to overcome the interference from the dark Ones. They still try to take some advantage from the changes in hand, but the Light is strong and holding its position. It will grow even stronger as more souls awaken to the truth. It can therefore be said that all proceeds well and will fulfill expectations. The timing of these events is always uncertain, but suffice to say that the ultimate outcome will be Ascension. Regardless of what course events take your success is assured. 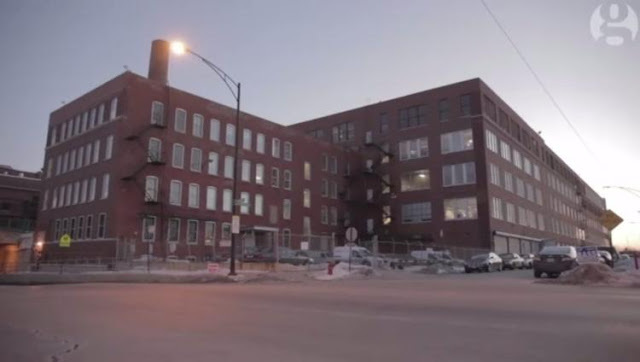 The Guardian has reported that Chicago Police are operating a secret detention facility that mirrors the CIA’s “black sites.” From violations of due process to torture, the revelations raise serious concerns about the deteriorating state of freedom and justice in the United States. 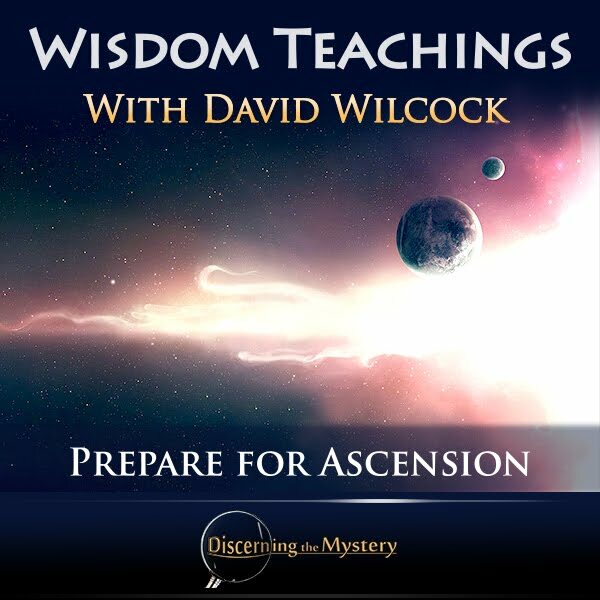 This episode of Wisdom Teachings was of particular interest to me for two reason. 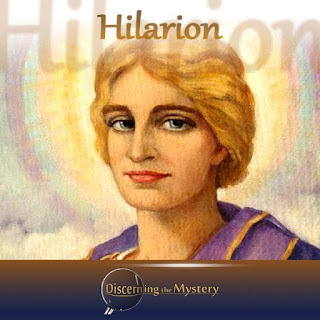 The first is that, for the first time, I was able to see, in depth, the actual connections between the various ancient myths which seem to define the cyclical, cosmic events we are now experiencing. 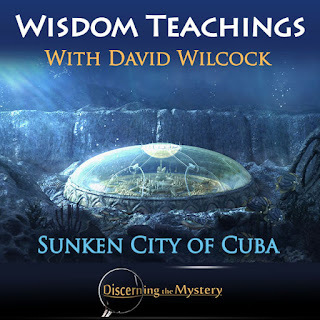 The second reason I found this episode exciting was the fact that it was the first time I was able to see the video evidence of the sunken, Atlantean-era city, off the coast of Cuba. Both of these aspects of the show demonstrate evidence of what the Law of One terms a “confluence of energy”. The subject of this confluence of energy was actually omitted from the original Law of One publications. As David Wilcock recounts, Carla Rueckert (the original channel of the Law of One text) left a section of the text out because she felt that the information it contained was too shocking for humanity to hear. Wilcock described how he and Carla would have debates regarding the transformation of humankind according to the text. The topic of debate was whether this change of humanity was to be spontaneous or gradual, and over a longer period of time. Wilcock described how this was frustrating, as Carla kept arguing the point that the change was gradual and yet at the same time, held back the information which may have proven it to be spontaneous. As you move through the powerful energies of these times, know that you are never truly alone or forgotten. Much that is within you is being transmuted and transformed into a higher version of your self. This can be uncomfortable at times. We advise rest and being good to self while this is happening. 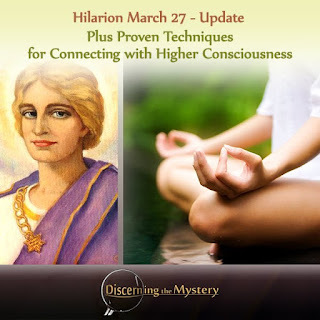 All lower vibrations are now exiting from your human operating system and while this occurs, it is important to accept and embrace them as part of your evolving humanity and just allow these experiences until they leave. Do not feed them or make yourself wrong because of this experience. You are not wrong to have this experience so do not negate self. In the higher perspective of these changing times, you are setting new guidelines for the highest vision of your own life in order to manifest it in your personal experience. You do not need to please others while this happens or seek their approval because you are a sovereign being as are they and have the gift of expressing free will. In this article, I chose to combine the two episodes of “Cosmic Disclosure: Ubuntu and the Blue Avians' Message”, Part 1 and 2. While watching these episodes, it was clear that they were of a different format and flavor than previous episodes. 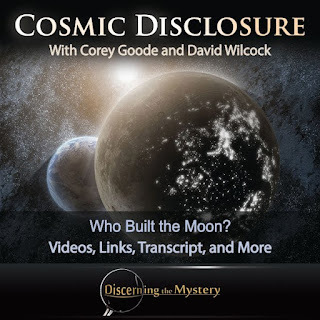 We normally hear the testimony of Corey Goode regarding past and present events from his experiences with the Secret Space Program, which are quite intriguing. However this time, the focus was more terrestrial. 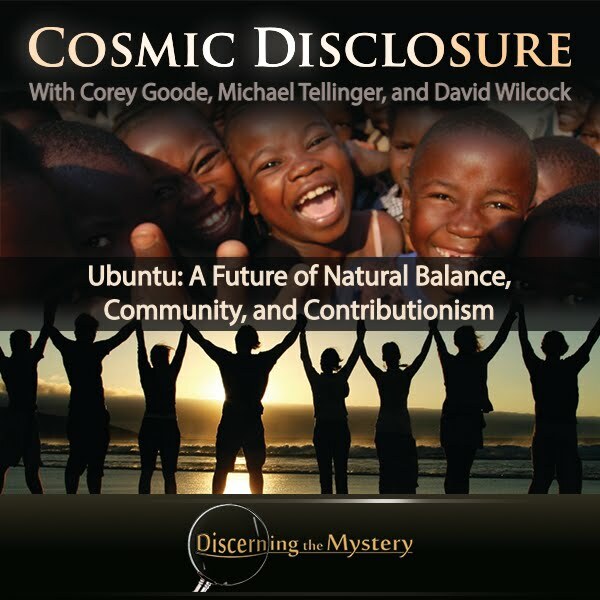 These episodes focused on the ancient African principle of “Ubuntu”. The philosophy behind this principle could be termed “unity within community”--a sort of sharing and caring for one another. When an individual succeeds within a community, the entire community succeeds. This is how nature functions. Each organism survives, and thrives within its environment, and as it does, it contributes in some way to the other organisms around it. A more traditional way of putting this principle is, “I am who I am because of who we all are”. This is the staple of Ubuntu. In recent times, Dutchsinse has received a hefty amount of vindication with regard to his claims in the past. 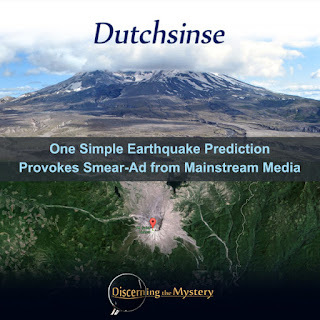 Dutch has become well-known for his unconventional view of meteorology and geotectonics, and has many times been attacked by those whose only interests seem to be upholding their own blind, skeptical point of view. However, on one particular matter, this has completely changed. 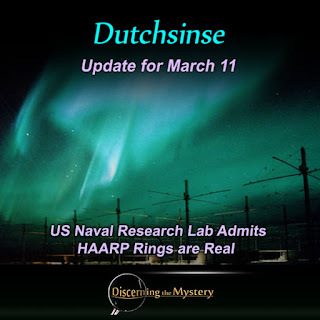 In February, 2013, the US Naval Research Lab completed experiments which confirmed the phenomenon of "artificial ionospheric plasmas", or the more commonly termed, "HAARP rings". NRL News had this to say. 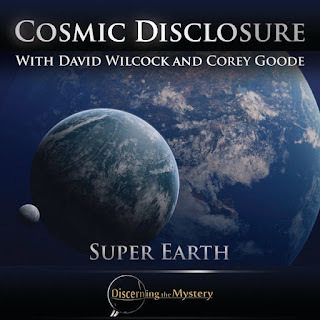 In this episode of Cosmic Disclosure, Corey Goode gives details on the subject of the "super-Earth" which is said to be a former planet in our solar system (Maldek). As discussed in previous episodes, this planet was destroyed in a war which took place many hundreds of thousands of years ago. I found it interesting to hear this testimony, as it came from Corey's account of the information from the smart-glass pads. (As discussed previously, these glass pads are advanced media devices said to be used among Secret Space Program personnel.) It was particularly interesting because at the time, Corey had never read the Law of One material, and yet we hear this SSP material corroborating many of the details listen within the Law of One text. This is an intricate puzzle which we have been exposed to in recent times. We have a situation in space that is completely foreign to most people here on Earth, and we are tasked with retrieving and verifying any helpful information to help us solve this puzzle. Though our task is not yet complete, this episode provides a separate, and yet congruent view of the ancient history of our solar system. 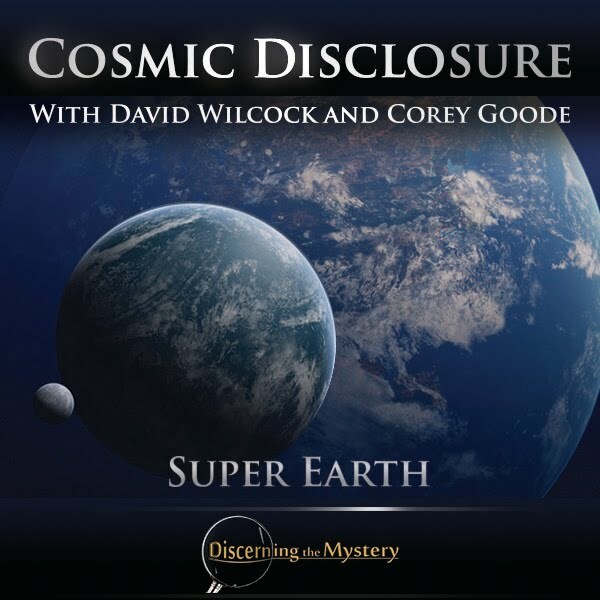 With that, here is the transcript from the episode, "Cosmic Disclosure: Super Earth." 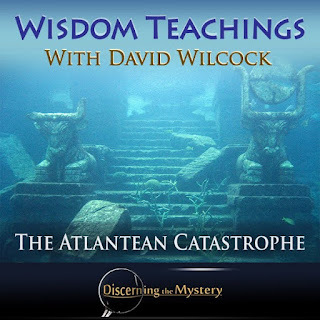 This episode continued the discussion of ancient civilizations that experienced the great cataclysms of the past. It focused on the destruction of one ancient city that seems to be closely related to Lemuria. 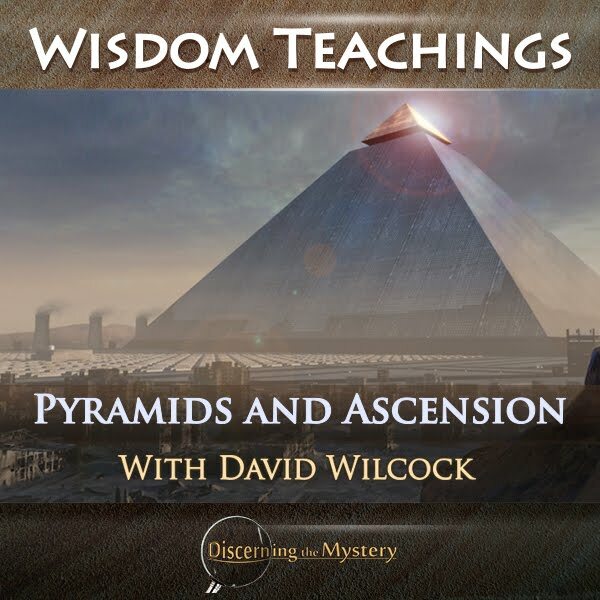 David Wilcock starts off with a recap from previous episodes of how the different civilizations received pyramid technology from the Ra group, but instead of using it for positive ends, they created an elitist society and kept the benefits of this higher technology to themselves. The cataclysms that followed were a sort of karmic balancing of all of the negativity these civilizations brought to the Earth. 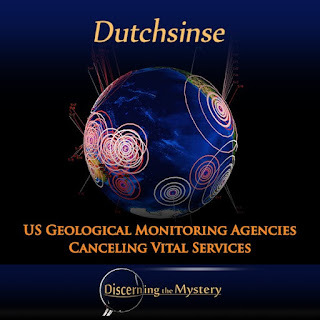 On March 2, Dutchsinse disclosed evidence that the USGS (United States Geological Survey) was most likely omitting data from their website and database. He starts out observing different earthquakes using the USGS feed on the Earthquake 3D software, acknowledging that these earthquakes did, in fact, take place (and were significant in magnitude). However, instead of recording these events from their own feed, the USGS seems to have omitted these earthquakes from their records. One particular quake was located in western Indonesia and southwest Sumatra with a 7.8-magnitude rating. This is the same fault line which caused the mega-tsunami back in March, 2005 . This quake can clearly be seen, and yet the USGS not only failed to record it, they actually decided to stop monitoring the area entirely. Time has come to release a great portion of the Ascension Plan for this planet. The Ascension window has opened on this planet on May 25th, 1975, had its turning point on August 11th, 1999 and will close on July 7th, 2025. It was always the plan of the Light forces to clear the primary anomaly of darkness and to trigger the Event within this time window, and that plan did not change. This episode of Wisdom Teachings began with a rather profound introduction. David Wilcock made the statement that this information was the most important of all that he has divulged within the series. That is, that we as human beings are here for a specific purpose. This purpose is not based in wealth, power, or anything else within the material. Rather, our purpose is based within the spiritual. There is an agenda that is being fulfilled through our experiences. This agenda is that each of us learn to be more loving, more kind, generous, and forgiving. No matter what situation we find ourselves in, this purpose, in one way or another, is playing out in our everyday experiences. I find it interesting, yet not surprising that this may be a true purpose in life. It would make sense, as every major religion holds these as core values (though many of these religions tend to stray from these values when it comes down to practical application). It is possible that at some point, these faiths were more accurate, but over time, became distorted. People who are able to help bring Ascension that much nearer are very active, but they are for the time being still up against the actions of the dark ones who adopt delaying tactics. 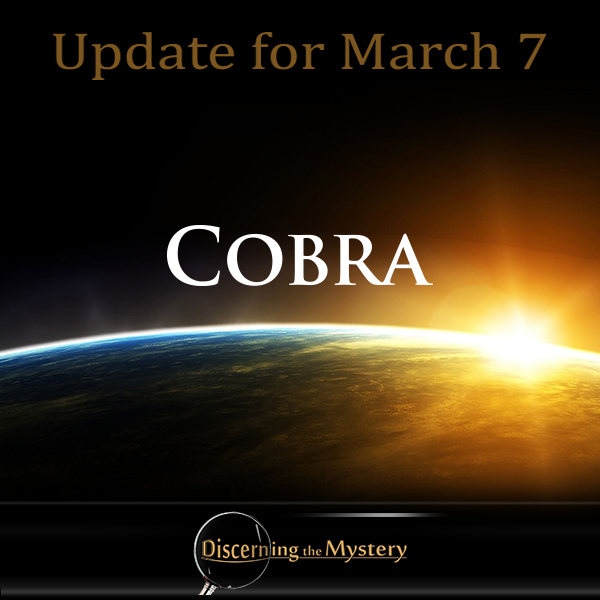 However, their attempts to delay the inevitable are futile and will do little to stop disclosure coming out within a reasonable period. It has been decreed by higher forces that the necessary action should be taken to ensure completion as planned. Those doing the work of the Light are protected and are helped to carry out their tasks. The Blue Avians continue to oversee what is taking place but will not interfere with our freewill should we elect to follow a different path to the Light. There is however a plan in place that will lead us ever onwards to a successful Ascension. It cannot be allowed to fail and it is expected that the followers of the Light will succeed. There are a number of powerful influences at work, and it is expected that they will overcome any obstacles placed on the path of the Light. So be confident and do not allow doubts to creep into your thoughts. 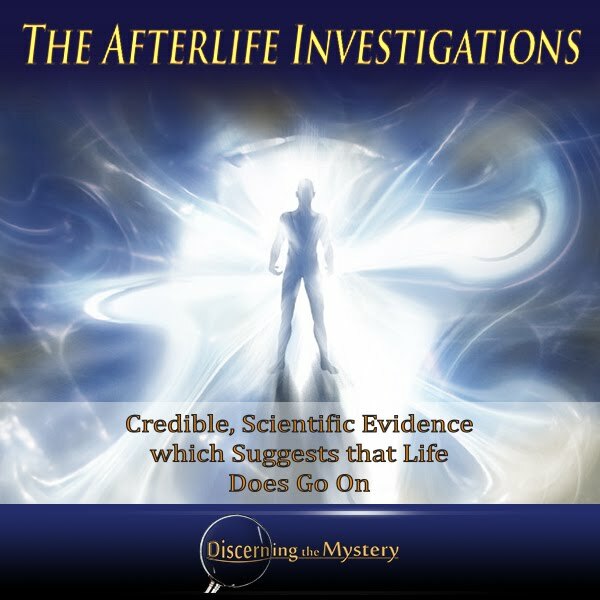 Many of us believe that life is more than it appears to be, and that our experiences go far beyond that which we're able to sense within average, physical interaction. We are all accustomed to viewing the world around us with a certain sense of normalcy, but could there be another side to it all? ...or even multiple sides? Could there truly be a dimension of life that we have not yet accessed on a personal level which may provide greater understanding of who we truly are? One group of investigators believes they have found an answer. ...and that answer is quite extensive. In 1993, a group of investigators set out to uncover the truth about what many refer to as the "afterlife". They employed the expertise of multiple investigators from numous professions, as well as multiple, third-party scientists to observe and record their sessions. The footage and data they gathered may cause even the most inflexible of skeptics to rethink their opinion. Here is an excerpt from their website describing the details. 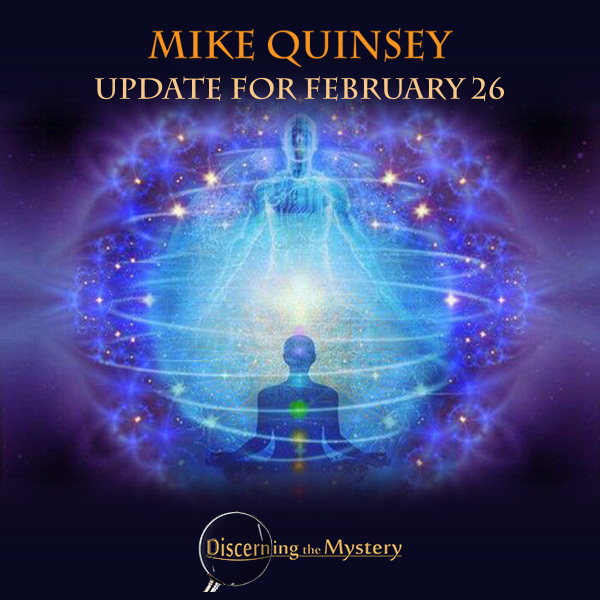 You are experiencing the effects of the previous downloads that have been given and are finding yourselves going within as the inner revelations come. There is much inner work being accomplished as you realize that somewhere along the way, you have become the observer of your own life. This is a mighty step forward and will serve you well when thoughts come up to the surface. You can then simply say to yourself, “Oh, this is old energy, I do not need to do anything with it, I choose to let it go.” Immediately replace this with a happier and more empowering thought that makes you feel good and happy about something positive that is occurring in your life. This is YOU taking back your personal power one thought at a time! This presentation quite possibly contains some of the most important information you will ever encounter. I say this because, for the first time ever, an individual has combined proven, scientific fact from multiple disciplines, and with them, (in a way) single-handedly solved the scientific "unified field theory". Not only this, but as we look at the scope of this information, we may also realize that these facts have very significant philosophical and spiritual implications for each one of us. If we want to know who we are, why we are all here, and what our true purpose is, this information is very likely to help us answer these questions. We know that knowledge is power. Each of us has our own right to this inherent, internal power, but in order to use this power to its full potential, we have to bring our own knowledge to its full potential. This is most important when there are those around us and within our society who deliberately try to take this power from us. With this realization, our learning becomes vital to our very survival and prosperity. Many have tried their best to distract from this information, to counter it, to launch preemptive, disinformation campaigns against it in order to lessen its impact, but their efforts were all in vain. The knowledge is ours to explore if we so choose. So with that, here is David Wilcock's lecture from the Conscious Life Expo 2016 (in paraphrase, along with complementary information and links). This is another example of the Mandelbrot set. Click here to view the animations. 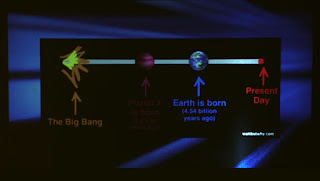 Suppose that just as our planet was born roughly 4.54 billion years ago, there was another planet. 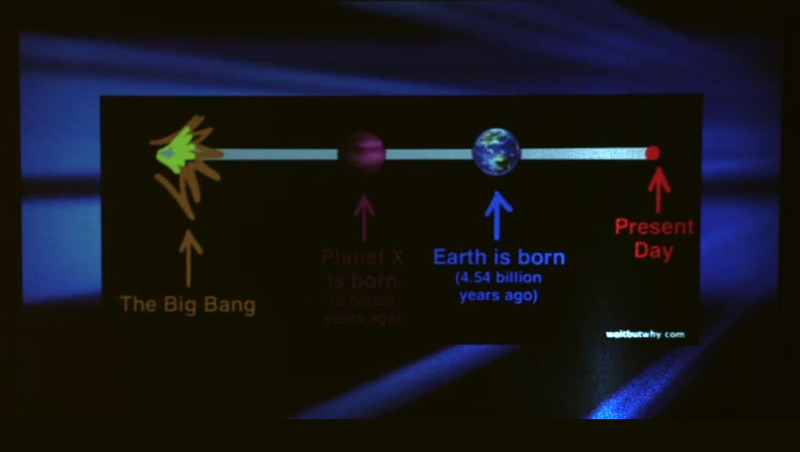 Only that planet was born roughly eight billion years ago. That's 3.46 billion years before Earth. 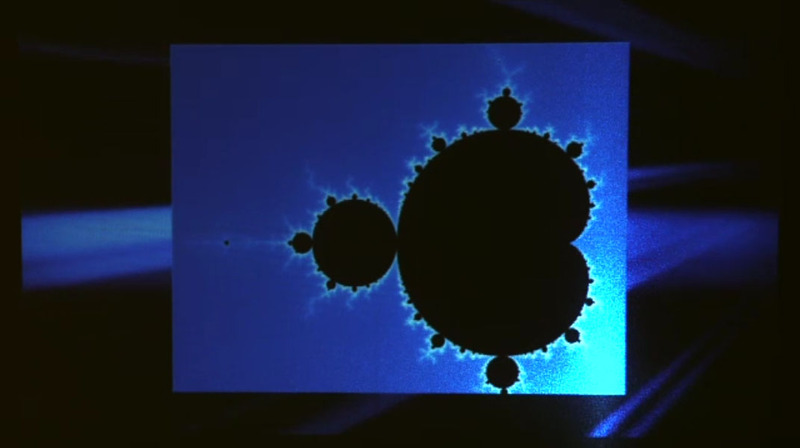 Here are two animations of the Mandelbrot set. Notice that no matter how far we zoom in, there are always multiple expressions of this exact same shape. This is a perfect example of the concept of "self similarity at all levels". This year's Conscious Life Expo brought many new revelations, and much more is said to be on the way. 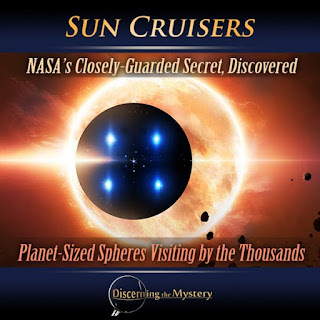 One of the subjects discussed was the arrival of the large, planet-sized, spherical ships that began arriving in our solar system during the 1980's. The first of these spheres came in the early 1980's, and as it did, it began to orbit each planet one by one. It started with Pluto, then moved to Neptune, and then Uranus. Due to this pattern of motion, this first sphere was termed "The Seeker". This sphere had two portals--one on each side. According to David Wilcock, these portals were measured to be 800 miles wide each. Three different insiders came to Wilcock with corroborating intel with regard to these details. One strange issue with this sphere was that it would not respond to any attempts at communication. It was hailed numerous times by Solar Warden ships, but no answer was given, accept, "We are peaceful explorers". The Solar Warden ship basically responded with the message, "GTFO". The people within the cabal/Illuminati thought that these spheres were their own "gods" returning to help them establish their New World Order, but of course, they were wrong. These spheres continued to arrive, but their appearances became more numerous around 2012. These are the images that were displayed at Wilcock and Goode's presentation at this year's CLE. They were originally collected by SOHO (Solar Heliospheric Observatory), a NASA platform. 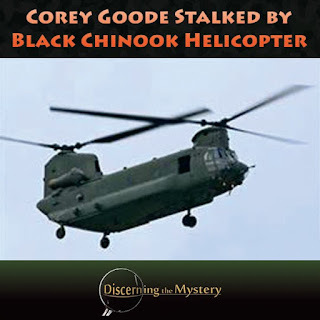 Recently, Corey Goode encountered a Chinook helicopter that seemed to be specifically focused on himself, and his house. This happened very recently--soon after he was warned to back off from the "full-disclosure" narrative. 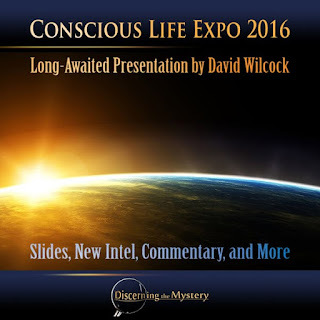 In this footage (which debuted at this year's Conscious Life Expo) it looked as though Corey was trying to stay somewhat out of sight, but at the same time, was trying to get a clear shot of the people who were making it a point to stalk him. As Goode maps out the scene of how this encounter took place, he describes going outside to find this helicopter hovering very close to his house. 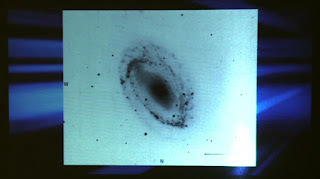 It would hover, circle around, and come back to repeat this process over and over again. This went on for around six minutes. The strangest part of the situation is that Corey doesn't live anywhere near a military base or installation of any kind. As I understood it, these choppers have never taken any route close to his house. Not only, this but as David Wilcock mentioned, it was possible to see these people looking directly at him during this encounter. That's how close they came.